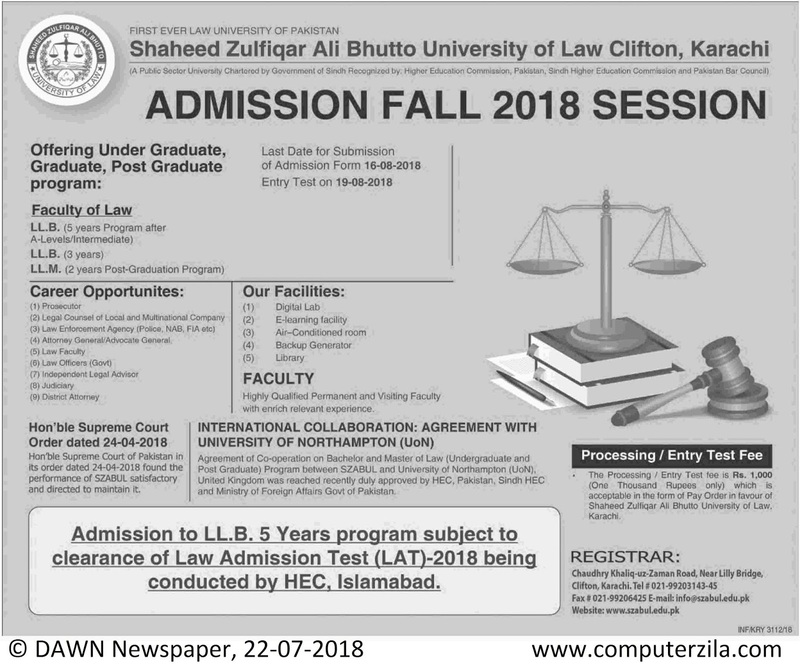 Admissions Open at Shaheed Zulfiqar Ali Bhutto University of Law's Main Campus, Clifton Karachi for the batch Fall 2018. SZABUL offers admissions in different fields of study for Bachelor and Master Programs. Admission Fall 2018 Session in first ever law university of Pakistan. Admission to LL.B. 5 Years program subject to clearance of Law Admission Test (LAT)-2018 being conducted by Higher Education Commission (HEC), Islamabad. Campus AdressChaudhry Khaliq-Uz-Zaman Road, Near Lilly Bridge, Clifton , Karachi , Pakistan.